Thank you all for the invitation to address you today on a very important subject at a critical time. I have chosen "The Politics of Safety - from Local to Global" as my subject, because I believe that many injury prevention successes derive from effective political work, and because there are global negotiations underway right now that will directly influence our efforts. My co-author and I work at the Trauma Foundation, not a research unit or a trauma center, but a non-profit advocacy agency that has as its mission the prevention of injury. That mission plunges us into the political arena on a regular basis. A dictionary defines "politics" as "the art or science of governing" and also the "intrigue or maneuvering within a group." Politics is not necessarily a dirty word. It is the way things get done in business, government, professional organizations, hospitals, clubs, schools, sports teams, and even in families. When advocating for prevention strategies, public health professionals need to recognize who the stakeholders are and what conflicting values they bring to negotiations. Stakeholders often include politicians, manufacturers, business leaders, public health professionals, consumer advocates, victims and survivor advocates, all with some standing in the regulatory process. In the politics of safety, the group must balance the conflicting interests of the stakeholders. This presentation lays out in broad strokes some thoughts about the politics of safety, drawing on the principles of injury control, the profile of injury in New Zealand, and our struggles to prevent injury at the local, national and global level. There are two major global issues that have extreme relevance to international politics of safety. These are small arms trafficking and the movement toward unfettered world trade. In particular, the focus will be on how it affects alcohol policy. At times the subject may seem to go far afield from the day to day concerns in the public health and injury prevention community. It may also seem too big, too complicated, too diffuse, too time consuming. However, it is imperative that we step back and see our work in the context of those economic and political forces which have an enormous influence on achieving our goal of a healthy and safe society. A real breakthrough in the way health and safety organizations might consider injury prevention came in the 1970s from Dr. William Haddon, a physician and first administrator of the US's National Highway Traffic Safety Administration. His "Haddon matrix" forces the user to consider many different ways to prevent injury. In this matrix, Dr. Haddon combined time factors with the three elements of the public health "triangle" -- that is host, agent and environment. Here we will address how politics affects interventions with host, agent and environment. Host factors: Clearly, one element in the sequence of injury-causing events is the behavior of the "host" or the person at risk of injury. People use unsteady ladders, leave pot handles sticking out where toddlers can pull them down, drink and then drive, speed in their cars, abuse their spouses and children, intentionally hurt or even kill themselves or others. Injury prevention education directed at the public or individuals aims to change unsafe behaviors. This is usually politically safe, because it places responsibility on the individual, and not on products which are tied to major corporate interests. Vector/agent factors: These are all the "things" that actually deliver the damage to tissue. These are the cars, motorcycles, knives, baby cribs, matches, toys, machines, sharp-edged tables, steps and stairs, guns, and the like. These are manufactured products, meaning that someone designed, made and sold them. Decisions about design, manufacture and sale are based on a variety of concerns - including available technology and raw material, economic feasibility, consumer preferences, and sometimes safety. Debates about how to balance these factors are often contentious, and pit consumer advocates against anti-regulatory and pro-industry forces. Here is where the politics of safety heat up. The physical and social environment: The risk of injury is not distributed equally across an entire population. We know that injuries are more numerous in communities with high levels of poverty and unemployment, sub-standard housing and poor education. The socio-economic environment exerts a powerful influence on injury risk. So does the physical environment. Homes have stairs, lighting, heating, furniture, electrical wiring, and hot water systems with various degrees of safety built into them. Cars drive on roadways which may have "black spots" and blind intersections, narrow sections, no pedestrian walkways, two-way roads with no median or divider. Organized leisure activities from the rugby union to lawn bowls are governed by rules and regulations that order behavior toward certain defined objectives. Cultures have social norms and customs which foster some activities and ban others. The scientific literature suggests that passive protection resulting from changes in products and environment are most successful in preventing injury. The website of the Injury Prevention Research Unit (IPRU) of the University of Otago Medical School provides a wide range of statistics and research on injuries and interventions. While the words "politics of safety" do not appear explicitly, I assume that the implementation and evaluation of injury prevention programs represented there deeply involve the political process. I will illustrate what I mean in two areas: rugby union and child passenger restraints. Injuries resulting from New Zealand Rugby Union. Rugby Union is considered to be New Zealand's national sport and is played by over 120,000 participants, both male and female. It has the highest incidence of injury of all the major sports played in New Zealand, and is the largest contributor of sports-related compensation claims made to the Accident Compensation Corporation (ACC). The IPRU is conducting research to evaluate the implementation of the recommendations for reducing injury to Rugby Union players contained in the proposal "Tackling Rugby Injury: Recommendations for Reducing Injuries to Rugby Union Players in New Zealand". The development of these recommendations was undoubtably a very political process. Three stakeholders were very involved in this process: the New Zealand Rugby Union, the ACC, and the IPRU. How much controversy and consensus is found in these recommendations? Since 1998, as a result of these recommendations, all players are required by the rugby laws to wear mouth guards for all games. The NZ Rugby Union is very supportive, and the top teams are seen to wear them consistently, although there is reluctance on the part of some players to wear the device. The politics of rule changes in sports is highly controversial. In the USA, the law requiring that professional ice hockey players wear protective head gear is a case in point. Resistance due to personal preference and social norms were in full force. The February 1991 front page headline of the National Sports Daily read, "Real men don't wear helmets". The modification of rules to US football to protect quarterbacks was extremely controversial. A sportswriter for the SF Chronicle recently suggested that the injuries happening in professional football should no longer be tolerated. One suggestion was to do away with fines, which are too easy for highly paid players to dismiss, and to suspend the offending player for as long as the injured player is unable to play. How long will it take to have this suggestion implemented? Opponents to change argue for example, that such changes pamper highly paid players, ruin the competitiveness of the sport, overlook the reality that "injuries are just part of the game," etc. Proponents argue that sports should not create life-long disability, nor should it make disproportional demands on a national insurance scheme. Here we have the politics of governing, not a nation, but a sporting event. Potential stakeholders such as players, fans, managers, trainers, sporting organizations, corporate sponsors, venue owners and vendors, TV and radio with contracts to cover the games, the ACC, public health and injury prevention specialists - all compete to determine how the game is played. Injuries to child passengers in cars: Motor vehicle crashes are the leading cause of injury death in New Zealand, and the 2nd leading cause of injury hospitalization. Between 1986 and 1995, 27% of infants dying in crashes were unrestrained. Child car seat use in motor vehicles has been compulsory in New Zealand since 1994. However, an observational survey undertaken by the Land Transport Safety Authority in 2000 found that, regionally, compliance with the law was as low as 68%. A recent IPRU study found that about 75% of respondents used car seats incorrectly. The literature suggests that there is a synergy between a safety-driven law, and public education. I found in my doctoral dissertation that people who thought there was a law requiring smoke detectors in residences were more likely to install them than those who did not think there was a law. This held true, regardless of the actual presence or absence of a law in their county. In the USA, compliance with seat belt laws increases when the state enacts a seat belt law that can be enforced as a primary rather than secondary offense. However, barriers to compliance and correct use of car seats appear to thwart even the law-abiding. A Dunedin study found that parents lack authoritative information about the right car seat for them. There was too much choice, and no standardized way to secure the car seat in the vehicle. The costs were also a barrier. As a result, SafeKids recommends that, in the near term, New Zealand restrict approved car seats to A/NZ Standard 1754, and in the longer term, adopt 1999 US Federal Motor Vehicle restraint standard with uniform anchor points. Clearly, these recommendations apply to imports, which depend upon trade. Trade issues are becoming problematic, as will be discussed later in this paper. Firearms in New Zealand: There are 210,000 licensed shooters in New Zealand, and approximately 700,000 firearms. In a typical year, 96 New Zealanders die of gun shot wounds and another 89 victims are hospitalized with gun injuries. Three quarters of these deaths are suicide, 12% are determined to be accidents, 12% homicides and 2% of undetermined cause. These facts lead to some important observations. Firearm injuries are extremely deadly. More New Zealanders die than are hospitalized due to gunshot wounds, a ratio not found in other mechanisms of injury. Secondly, the vast majority of New Zealanders who die of gunshot wounds do so at their own hand. This may lead some to argue that New Zealand has a suicide problem, not a gun problem. But this is not an "either-or" situation. Suicide is an opportunistic act which takes place in a moment of crisis. Access to a firearm greatly increases the 'success' rate of suicidal attempts, turning what could have been a cry for help to permanent silence. The challenge for injury prevention advocates is to focus on the motives as well as the means and to reduce access to firearms through education and regulatory methods. Firearm Death and Injury World Wide: There are 550 million firearms on this planet causing 550,000 deaths per year. 330,000 of those deaths occur through regional or group conflict, another 200,000 are due to interpersonal conflict and suicide. These numbers are admittedly rough, a best estimate of the Graduate Institute of International Studies in Geneva's Small Arms Survey of 2001. 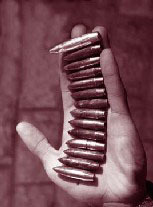 This profile is one of the first efforts to profile gun death and injury on a global level and to examine potential opportunities for intervention, including development issues, human rights issues, manufacture and distribution of weapons, and political definitions of licit and illicit arms. New Zealand's Involvement in International Efforts to Regulate Small Arms and Light Weapons: Far from excusing themselves from the firearms issue, New Zealanders have been centrally involved in international efforts to regulate small arms and light weapons. Historically, New Zealand has been committed to disarmament and active in the nuclear-free movement. We are now learning that the cause of most death in group conflict is not heavy weaponry but small arms and light weapons such as military style rifles, hand grenades and small rocket launchers which can be carried and operated by one or a few people. The following is a broad overview of the issues and ways in which injury prevention professionals can get involved. For more information on public health and small arms visit the websites of the World Health Organization project Small Arms and Light Weapons and International Physicians for the Prevention of Nuclear War. Current International Activities regarding Small Arms: The International Action Network on Small Arms - IANSA is a coalition of over 300 organizations worldwide, which have joined forces to address this global public health crisis. The various organizations come to the weapons issue from many perspectives; from domestic gun control advocates like Viva Brazil, the health perspective of IPPNW, and disarmament and peace organizations, such a Fund for Peace. In July of 2001, the IANSA members gathered in New York to attend the United Nations International Convention United Nations Conference on the Illicit Trade of Small Arms and Light Weapons in All Its Aspects and to lobby their respective delegations to support reforms. At the conference world delegates hoped to adopt conventions which would tighten international arms brokering regulations, create comprehensive systems for marking and tracing weapons, and to encourage countries to improve domestic gun regulations. Not surprisingly, the United States, a leading manufacturer and exporter of small arms rejected important elements of the convention, agreeing only to the most vague and unrestrictive language. The US position provided cover for other small arms producing nations like China and the former Soviet Union. Perhaps most disturbingly, the United States delegation pointed to the US Attorney General's support for the National Rifle Association's fallacious argument that the Second Amendment to the United States Constitution protects the individual right to bear arms. The idea that a US gun lobby group could stifle efforts to regulate the international movement of illicit firearms was rather astonishing and creates unique challenges for US based disarmament advocates. One response is to reach out to the health professionals throughout the world to join the debate. In addition to the Small Arms Survey, the World Health Organization has launched its project on the prevention of injuries due to small arms and landmines. The first project publication Small Arms and Global Health presents available public health data and proposes the development of comprehensive global surveillance strategies. The study looks at the public health costs, risk factors, long-term health consequences, impact on mental health, and the roles which public health professionals can play in preventing global gun death and injury. Among the data presented are country specific breakdowns of firearm death causation which show that very different numbers of death by group conflict, homicide, and suicide emerge in different countries. Researchers are just now able to analyze the contributing environmental factors which domestic public health professional can apply in their own communities. Leading experts in the movement, including New Zealand's Phil Alpers, were instrumental in bringing the public health community to the global gun issue. In September 2001, IPPNW, WHO, PFS-Finland, organized and hosted "Aiming for Prevention: International Medical Conference on Small Arms, Gun Violence." The conference was the first of its kind, bringing epidemiologists, medical journalists, public health policy makers and physicians together examine the impact of small arms on public health ands to develop strategies to reduce global gun death and injury. One result of the conference was the distribution of a concerted "Medical Call to Action" to reduce the flow of small arms and light weapons. A call for marking and tracing, surveillance-based approaches to public safety. Just one of the issues which the IANSA community supports is comprehensive marking of firearms. Law enforcement worldwide need to track the movement of guns from legal to illegal markets, just as medical researchers track and study the life of a pathogen. We think too often of firearm death and injury as a criminal matter, complete with shadowy international arms brokers from the pages of a John LeCarre novel. But a method as straightforward as marking each legally manufactured gun could cast light on the issue and prevent weapons from reaching narco-terrorists and warlords. It is interesting to note that the development of Vehicle Identification Numbers began as a response to international smuggling, not in the interest of auto safety. Here too, the nexus between legal, political, and public health and safety creates opportunities for the medical community to capitalize on seemingly unrelated political interests. In recent years, the administrative machinery of global trade has garnered considerable power over domestic health and safety policy. The World Trade Organization (WTO) routinely considers regulatory standards to be trade violations and subjects nations to monetary penalties. To date, much of the public outcry against the WTO has been framed by environmental, food safety, and human rights activists. The following is a very broad overview of WTO, international trade treaties, and their effect on injury prevention and public health. For more information on trade visit the websites of Public Citizen Global Trade Watch, the WTO, and the Trans-Atlantic Consumer Dialogue . The World Trade Organization (WTO), established in 1994 to administer the Global Agreement on Trade and Tariffs (GATT), is charged with eliminating trade obstacles and resolving international trade disputes. New Zealand is among the member nations of the WTO as well as regional trade pacts and partnerships such as APEC (Asian Pacific Economic Cooperation) and the ANZCERTA agreements with Australia. Prior to the establishment of the WTO, trade barriers were primarily defined in terms of tariffs and quotas. Now, trading partners can challenge the regulatory policies of sovereign nations as being "technical barriers to trade" or TBTs. This term includes manufacturing standards, worker safety protocols, medical device safety reporting standards, auto and aviation safety, chemical manufacture and flammability controls and any other safety standards related to goods. Disputes are resolved by a panel of WTO arbitrators culled from the WTO's professional staff. There is no public access to the dispute procedure, no non-governmental organization intervention, and no opportunity for independent appellate review. In addition, regulations must pass the extremely rigorous necessity test, wherein regulators must show that there is no less restrictive way to achieve their public safety goal. Since the inception of the new trade authorities, not one environmental or public health safety standard has survived a trade dispute. WTO officials are quick to point out that "losing" countries are not forced to abandon domestic health and safety policy. But if they choose to retain their own standards, they are required to pay "winning" disputant countries permanent fines and increased tariffs on other, unrelated, exports. For example, in recent years, citizens of the European Union developed serious concerns over food safety, including the presence of hormone residue in beef products. The issue was publicly debated, research was presented and discussed and hormone level standards enacted. The new EU standards, however, exceeded those of the US which then filed a complaint with the WTO alleging that the EU beef standards were a technical barrier to trade. The EU lost the dispute and is now subject to fines, payable to the US of $16 million (USD). While such outcomes do not, strictly speaking, force the countries and localities to abandon their own regulations, the outcome creates extreme pressure on policy makers to avoid responsible safety protocols which are deemed WTO-illegal. In addition, unrelated industries may suffer from tariff related penalties, adding new domestic opponents to the internal regulatory process. Should such considerations impact the development of domestic standards? In the global trade world, the term "injury" refers not to broken bones, bullet wounds, and burns, but to economic harm. Of course economics are a legitimate concern, but should they be the paramount concern? And should domestic health policy makers be restrained by commercial and business theories? In order to streamline trade and prevent future disputes, the WTO is working with member countries to harmonize regulatory rules and protocols for assessing public safety. There is no reason that regulatory cooperation, in and of itself, is contrary to public health and safety. The question remains, however, whether negotiators will bring standards up to higher safety levels or resort to the lowest common denominator. The underlying premise of the WTO and other trade pacts is that standards be "least trade restrictive." Where harmonization is concerned, consumer protection agencies such as the United States National Highway Safety and Traffic Administration do have a seat at the negotiating table along with industry representatives and trade economists. Public health advocates must recognize, though, their relative disadvantage within a forum that prioritizes trade above other social factors. Health and safety is not an exact science. We strive to prevent as much injury as possible to make activities and things safer, but drawing these lines is a matter of prioritizing values. The WTO standard for harmonized regulation is "risk assessment." This precludes the application of more stringent standards for particularly dangerous subjects. In the areas of food safety and chemical hazards, the potential for serious injury or unknown outcomes may call for a "zero tolerance" approach or application of the "precautionary principle" which requires industry to prove the long-term safety of their product. Under WTO standards, the burden is switched: governments and public health policy makers must prove that industry action will result in long-term harm in order to justify regulatory restrictions. This creates an impossible task for public health professionals who must prove that an agent, which has unknown potential for risk, has a quantifiable potential for risk. Harmonization can also have a direct impact on public health data collection practices. Proposals for harmonized medical safety device reporting requirements preclude reports of risk. Current standards include reporting events that cause or contribute to injury and death and events that if repeated could cause or contribute to injury and death. The proposed harmonization reporting standard includes only those cases in which injury occurs, not where repeated episodes would present risk. Harmonized standards for chemical classifications and labeling have implications for worker safety, and injuries caused by fire and explosions. A number of agencies are now involved in setting such standards, including the Organization of Economic Cooperation and Development, the International Labor Organization, and the United Nations. If this process proceeds, there will, no doubt, be cases where harmonization will increase safety standards for workers and domestic populations. The difficulty for public safety advocates and providers is that WTO standards and provisions provide a ceiling, not a floor, for safety regulation. As such, any domestic flammability, transport or worker safety protocols which go beyond the international standards would be vulnerable to WTO trade barrier challenge. Another method by which trade partners overcome domestic public health safeguards is through equivalence determinations. Equivalence does not require that different countries have identical standards, but that the practices are "sufficiently comparable." In 1999, the USDA Food Safety and Inspection Service made a determination that Australia's new meat inspection program was equivalent to its own. The systems, whatever their respective strengths and weaknesses, are not equivalent. For one, US protocols require government inspection while Australia's meat producers conduct their own inspections. Following this change in Australian inspections, health officials reported a 20 percent increase in salmonella poisonings. On the consumer end, imported meats in both countries will carry their own domestic seal of approval, despite the fact that they are subject to substantively different safety regulations. The WTO is currently negotiating the General Agreement on Trade and Services (GATS) which will impact the delivery of services within sovereign nations. In trade lingo, services include "anything you can't drop on your foot." In the case of alcohol, GATS would impact services related to the manufacture, distribution and advertising of alcoholic beverages. We know that high alcohol consumption contributes to unintentional as well as violent injury. In response, the injury prevention community has put pressure on policy makers to regulate alcohol distribution and access and to limit alcohol advertisements. The WTO , however, has ruled against such measures under the GATT agreement. Under GATS, alcohol injury strategies will be even more vulnerable. Alcohol consumption has very real public health costs associated with injury, violence, disease, mental health, crime and lost productivity. Linking tax rates with alcohol content serves two purposes; it requires the manufacturer to pay the true costs of its products, and reduces alcohol consumption. The prime objective of free trade though is to increase consumption of goods, a direct conflict with the health-based interests in discouraging excessive drinking. In an alcohol tax dispute filed by the US against Chile, progressive content-based taxation was deemed to be a trade violation. Under WTO rules, products imported from member nations must be treated no less favorably than like products of domestic origin. The result of Chile's tax system was that 95% of foreign products were taxed at the highest rate, while 75% of the Chilean alcoholic products were taxed at the lowest rate. The EU argued that the lower alcohol Chilean and higher alcohol foreign beverages were 'like products' and therefore the higher tax rate violated trade policy. Chile countered that alcohol content was a neutral category, that the products were not "like products" and that the effect on foreign imports was an unintended consequence of their legitimate tax system. The WTO disagreed. Another case challenges Swedish alcohol advertising restrictions. The law passed for the express purpose of reducing alcohol related harm disallows ads which are insistent or encourage alcohol consumption. The law also prohibits television and radio ads, and places restrictions on the placement of print ads. In order to preserve these restrictions, Swedish authorities are obliged to prove that the measure is proportionate to its goal, that there are no alternative approaches which would be less restrictive, and that the regulation is not arbitrary, discriminatory or a protectionist measure in disguise. The GATS agreement now under negotiation will further endanger national and local alcohol policy. The GATS definition of state run enterprise or monopoly is extremely narrow and may expose government alcohol monopolies to international oversight and restrictions. In addition, GATS would effect a myriad of services related to alcohol, including restrictions placed on who can buy and sell liquor, number and location of distribution outlets and hours of sale. In the political arena, the primacy of free trade creates considerable challenges for the public health community. Those who advocate for strict injury prevention standards, automobile safety, fire prevention and the like must contend not only with domestic commercial opposition but with un-elected international trade officials with authority to quietly supercede local law and whose critical analysis of risk bears little relation to that of public health advocates. Manufacturers themselves have a stake in safety, though sometimes they are slow to come on board. When Ralph Nader published Unsafe at any Speed, the party line was that safety doesn't sell. We now see ads for high-end cars which pitch safety features such as airbags and crash test ratings as a primary selling point. In the developed world, the idea that a healthy, stress-free employee base can ultimately contribute to the bottom line is commonly accepted, though not universally practiced. There is also the goodwill to be considered; companies spend tons of money improving their public image, community goodwill and a safe reputation are bankable elements which can be used as selling points for responsible regulatory standards. These arguments will not always be effective, especially in industries which manufacture more inherently dangerous products, such as alcohol and tobacco. The conclusion here for injury prevention advocates here in New Zealand and around the world is to get involved. In the area of small arms and light weapons, the United Nations will revisit the convention in 2006. In preparation, injury prevention advocates can join the effort to create comprehensive injury data collection, responsible surveillance systems and health-based initiatives to reduce gun death and injury. Global trade negotiations are going on as we speak; in November, the WTO's fourth ministerial conference will take place in Doha, Qatar. This is the highest decision making body of the WTO and they will discuss many issues related to public health and safety, core labor rights, increased transparency of trade disputes, and pushing forward with the GATS trade in services. The ministerial was slated to discuss drug patents as well, but just weeks before the conference, the issue was tabled because of differences of opinion and legitimate objections to the intellectual property rules' impact on public health. Act now: We encourage injury prevention specialists to create networks addressing the issue of small arms and light weapons and the issue of world trade. These small groups of interested safety advocates can, with relative ease, watch world events, distill information and provide the broader safety community with timely information. Such networks break up seemingly monolithic issues into manageable advocacy. The time is now.